Beginning of the Gupta Empire: The period prior to the establishment of the Gupta Empire was known as the Dark Age. The origin of the Gupta kingdom is ambiguous and continues to be a topic of debate among many historians. The Gupta’s rose to power sometime around 240 AD. The founder of the Gupta Empire was Sri- Gupta. He ruled from 240- 280 AD. 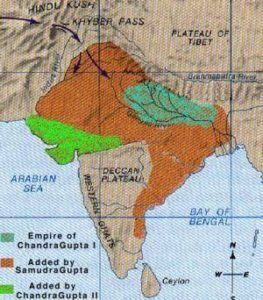 During the reign of Sri- Gupta the Gupta Empire comprised of Bengal and some areas of Bihar. However, the Empire reached its zenith during the rule of Chandragupta I. Chandragupta I was the grandson of Sri- Gupta and ascended the throne as the ruler of the Gupta Empire after the death of his father, Ghatotkach. He was considered to be a powerful ruler who expanded the territories of the Empire. Chandragupta I had acquired the Lichchhavi dynasty Kingdom by virtue of his marriage to the Lichchhavi Princess. It comprised of an area stretching from Ganges River to Prayaga (modern-day Allahabad). Chandragupta, I was succeeded by two most capable and powerful rulers like Samudragupta and Chandragupta II.